Today, March 2, is Dr. Seuss’ birthday. Dr. Seuss remains popular for his whimsical illustrations and text that is irresistible to children and adults. Parents feel nostalgic as they remember learning to read with books like [amazon_link id=”039480001X” target=”_blank” ]The Cat in the Hat[/amazon_link] and [amazon_link id=”039480029X” target=”_blank” ]Hop on Pop[/amazon_link]. Inspired by artwork from one of Dr. Seuss’s well-known stories, the design on this plush, cotton terry bath mat features a contented fish swimming in his bowl. Bath mats are made of plush ring-spun cotton. Fibers are yarn dyed for lasting, vibrant color. Cut pile has a plush, velvety feel. Backed with slip-resistant natural latex. 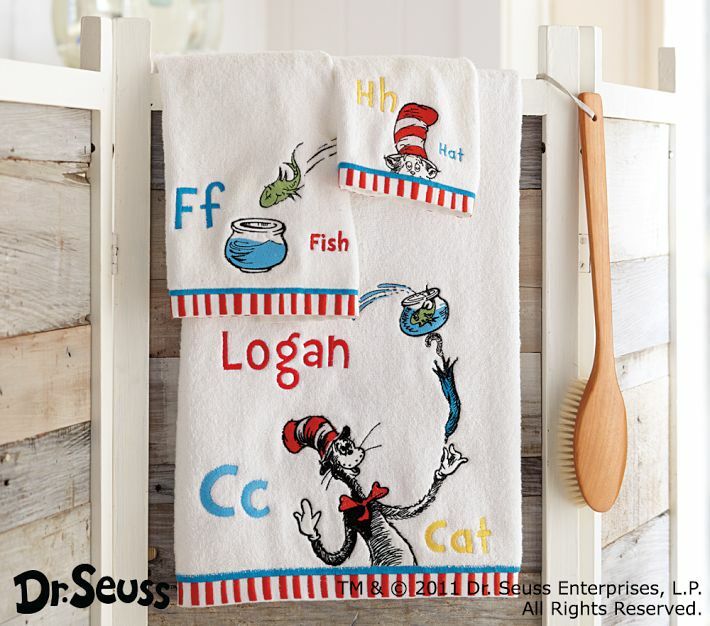 Using original artwork from Dr. Seuss’s The Cat in the Hat, we created super soft towels that highlight his memorable characters. All of these products are on sale right now! Yesterday, I wrote about the plethora of 70 product tie ins to the new Lorax movie. I don’t feel the same outrage and disgust with these Dr. Seuss products. Why? None of the Pottery Barn Kids products contradict the themes of the books they represent, like the Mazda/Lorax does. Do they promote commercialism? Yes, but I do think products can do so without harming children and actually promote literacy. What’s wrong with using a Cat in the Hat towel after a bath and then reading the story before bed? We live in a world where yes, marketing is directed at children. Parents are huge consumers. If you need something, then yes, buy it. If you don’t, then don’t. That’s where I don’t have a problem with products like these if they are purchased on the basis of need and not desire. The problem with the Lorax products is they contradict the message of conservation and environmentalism in the book. Remember, you don’t NEED a Thneed! Would I buy these products? Maybe. As mentioned above, the marketing doesn’t bother me, but I do wish the were organic. Pottery Barn Kids does make some products with organic cotton.